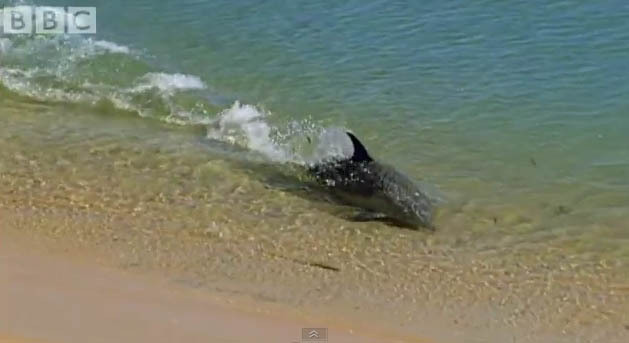 In western Australia, dolphins face an interesting challenge. The fish they feed on, have resorted to hiding in extremely shallow water. “Tail slapping,” a method dolphins use to stun their pray, does not work in this case, so they have implemented a new technique. They build up speed, and then they hydroplane literally onto the beach. This great video from the BBC captures dolphins exhibiting this behavior. The dolphins are able to use the shoreline as a barrier, while directing their pray closer and closer, until it has no more space to hide. It’s extremely interesting to see that the younger dolphins watch and learn how to hydroplane from their mothers. It’s important to note that due to mating habits, it’s extremely unlikely that this behavior is genetic in nature.